Posted by Steven Bartus in Breakfast, Turkish Cuisine. When I visited Atatürk Orman Çiftliği two week ago, I was reminded that in addition to having very good kokoreç, Doğata is also renown for its Sunday brunch buffet. I have previously profiled the morning offerings of Liva and Big Chefs on this blog, so I thought it would be appropriate to make the trip and see what Doğata has to offer. In general, the buffet is good. The spread is traditional and features the staples of a Turkish breakfast. Cheese, vegetables, fruits, jams, börek, poğaça, simit and dolma are all in attendance. That is also a station where omelets and other egg dishes are made to order. I sampled the karşık omlet and sucuklu yumurta, and both were very tasty. 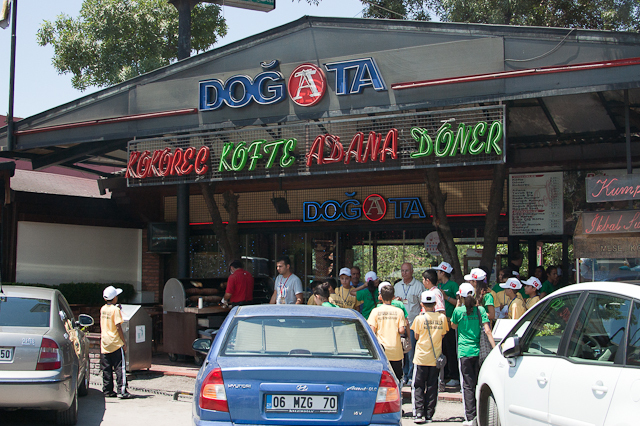 Doğata’s main selling point is that many of the ingredients are sourced directly from the A.O.Ç. This fresh difference is quite evident in the food. While there is nothing revolutionary about the buffet, there is certainly a lot to enjoy about a Turkish breakfast done simply and well. Doğata doesn’t offer the elegance or sophistication of Liva or Big Chefs, although the simple garden setting is a pleasant place to spend a Sunday morning. It doesn’t have the magnificent pastries and desserts, either. But Doğata does have the edge when it comes to price: 16TL ($10.30 at 1.56TL/$) is an amazing bargain compared to the 30TL ($19.25) you will spend at the other, more upscale places. Doğata is certainly worth a visit. It won’t change your life, but you’re unlikely to walk away from the brunch feeling unsatisfied. Some of my friends even suggested that the smaller selection and lower price made Doğata more attractive than Liva or Big Chefs because you don’t feel the need to overeat, a common pitfall at buffets when a cornucopia of food is placed before you..
Doğata is located on Silahtar Cad. in the A.O.Ç. (Google Maps). In addition to the 16TL Sunday brunch, it also offers a 11TL ($7) breakfast plate every other day of the week. Liva is another strong contender in the battle for the best brunch buffet in Ankara. The famous pastane chain offers a quality spread of Turkish breakfast favorites very similar in size and scope to that of Big Chefs. While both places make for an excellent meal, Liva’s made-to-order omlet and gözleme station might give it the edge. I really liked the börek as well. However, the restaurant itself (specifically, the one in Çukurambar) lacks the charming decor and ambience found at Big Chefs, and the buffet area tends to get very congested. You will have to try both for yourself to determine which is deserving of your Sunday morning feast. It’s also worth mentioning that Liva’s cakes and pastries are some of the best in the city. If you are looking to impress your friends or colleagues with a tasty treat, this is the place to visit. One recommendation: the Çikolatalı Dilim Pasta. 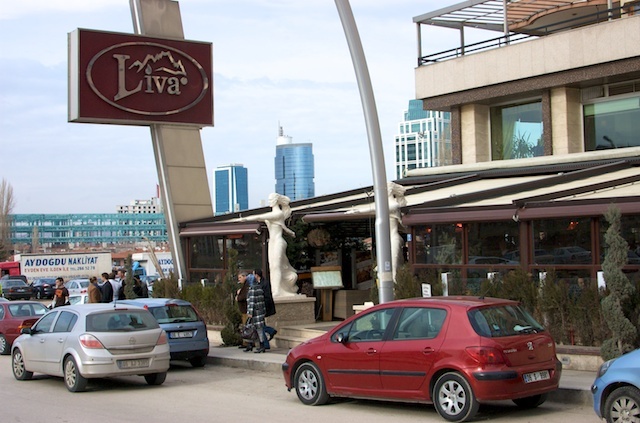 Liva has several branches around Ankara that offer brunch from 9:00 to 15:00 on Sundays. Check their website for specific information about the nearest location (Google Maps). Like Big Chefs, the price is 30TL per person ($20 at 1.51TL/$) including drinks. Breakfast might be my favorite meal of the day. There is always something really awesome about waking up and having a very serious meal to get you going. On the weekends, a long and leisurely brunch with friends ranks among the greatest joys in life. 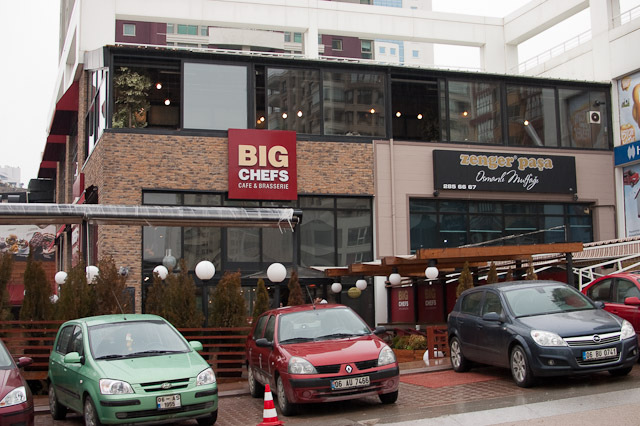 For those seeking such a superlative experience in Ankara, I suggest you check out Big Chefs. Big Chefs offers a massive Sunday buffet featuring all the staples of a Turkish breakfast plus a great selection of salads and pastries. You will undoubtedly get your fill of delicious cheeses, jams, fruits and vegetables. For those with a sweet tooth, the variety of cakes is daunting. My advice: try the chocolate-banana one in the middle of the dessert spread. Yes, like with most buffets you’ll probably end up eating too much. Just accept it, call it a “blinner” (breakfast-lunch-dinner), and have a good time. There are three Big Chefs in Ankara: on Filistin Sk. in Gaziosmanpaşa, in the Minisera AVM in Çayyolu, and on 29. Cad. in Çukrambar (Google Maps). However, brunch is only served at the latter two between the hours of 10:00 and 14:00 on Sunday. The price per person is 30TL ($20 at 1.46TL/$) including drinks. Reservations are recommended.